Will Freedom of Speech be Banned in America? Michael Robertson hopes so! For Robertson to shut Freespire.com down, he needs to prove I had bad faith intent to "profit" from the site, such as by confusing visitors. For example, show that people visiting Freespire.com would somehow be so daft that they would be confused and think the site was run by Xandros (the trademark holder for the term "Freespire") and that this confusion was created so that I would profit from the site. Xandros, the trademark holder, has never expressed to me any problem with the Freespire.com site or asked me to turn the domain name over to them. It's Robertson (who does NOT have the trademark) who is spending tens of thousands trying to take Freespire.com down and silence his detractors. Does anyone really think Robertson is looking out for Xandros? Robertson doesn't even look out for his OWN employees and shareholders, why would he care about Xandros? He clearly only cares about one thing--twisting trademark law to kill freedom of speech that is critical of him. 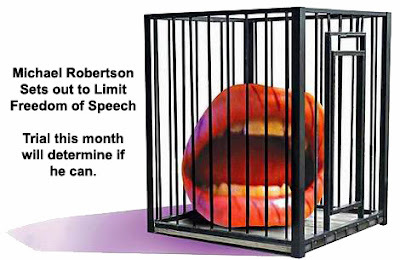 Robertson loves to whine about others who don't respect freedom of markets, speech, etc., and yet he's the one wasting loads of cash trying to do that very thing. Long live freedom of speech. Hopefully the court will defend it later this month. I have every confidence they will. I'll be back to report when it does.